Virat Kohli’s 39th ODI century and MS Dhoni’s vintage ice cool unbeaten 55 helped team India level the 3 match ODI series against the Aussies 1-1. Batting first the hosts at one stage looked to score over 300 courtesy a century from Shaun Marsh. However, some tight bowling at the death by Bhuwaneshwar Kumar helped India restrict the Australians to 299. He got 4 scalps in his 10 overs. In reply India got a brisk start before losing Shikhar Dhawan after he had scored 32 runs. Rohit and Kohli then stitched together a partnership which was broken as soon as it was started to look threatening. Kohli was then joined by Ambati Raydu. 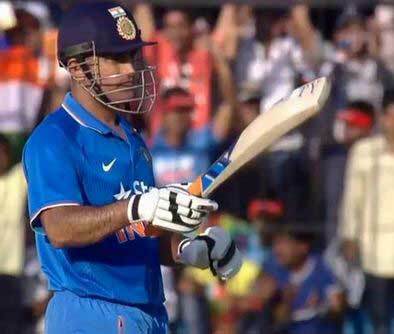 Raydu was dismissed for 24 and was followed by Dhoni who was under fire for his slow scoring the 1st ODI. Here too Dhoni took his time to settle in while Kohli kept pushing for ones and twos. In the process Virat Kohli brought up his 39th limited over century. The Indian skipper departed on 104 trying to accelerate the scoring. MSD at the other end remained composed and together with Dinesh Karthik stitched a 57* partnership in just 5.4 overs to help the visitors level the series. Dhoni and Kohli shared a 82-run partnership for the fourth wicket. After this, Dhoni and Kartik duo won the team India. On behalf of Australia, Stonis, Jason Behrendorff, Richardson and Maxwell all took a wicket each.Virat Kohli was adjudged the man of the match for his century.